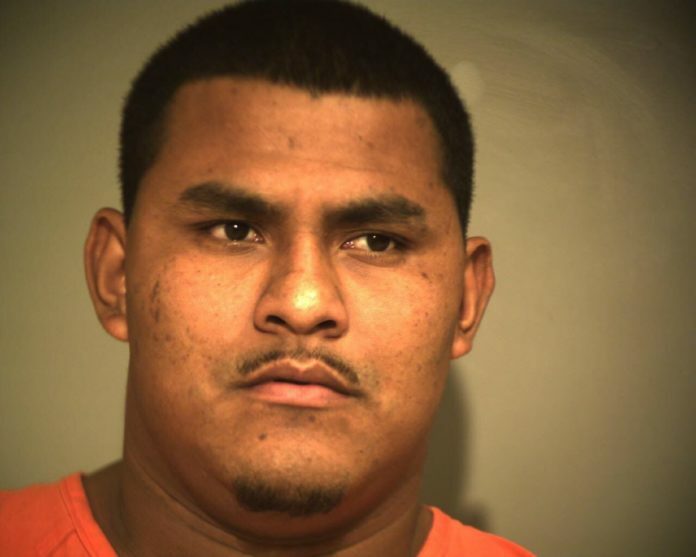 Hidalgo County Sheriff's Office investigators searching for Maurisio Vidal, 27, of La Feria. NEAR HARGILL — A man connected to a 2016 murder near Mercedes fled from Hidalgo County sheriff’s deputies Thursday, according to the agency’s spokeswoman Jena Pacheco. Mauricio Vidal, 27, of La Feria, ran from a truck during a traffic stop near Hargill at about 9:30 a.m. on Thursday, according to information provided by the sheriff’s office. The driver, who also bailed out of the truck, was arrested and remained in custody pending identification and arraignment. Deputies with the Hidalgo County Sheriff’s Office and assisting agencies searched a large area of ranchland near the location of the bailout, which was in the vicinity of Mile 22 1/2 North Road and Farm-to-Market Road 493. The search was then called off at about 2:15 p.m.
Vidal is one of two murder suspects still at large in connection with the April 2016 murder of 44-year-old Gilberto Garces, who was found dead with multiple gunshot wounds to the chest in a cornfield near Farm-to-Market 491 outside of Mercedes. In 2016, the Hidalgo County Sheriff’s Office also issued a warrant for the arrest of Sergio Medrano in connection with the murder. Two others — Ramiro Garcia-Lopez Jr. and Adalberto Guardado Mosqueda — were arrested on capital murder charges in 2016. Lopez, the owner of Mid Valley Tire Shop in Mercedes, where the murder victim worked, remained behind bars at the Hidalgo County jail as of Thursday. A court date has not been set on the murder charge. Mosqueda is currently serving a life sentence for capital murder. Investigators believed the motive in the 2016 murder was money owed for a possible drug deal. Those living near the area of near Mile 22 1/2 North Road and FM 493 are asked to remain vigilant. Those with information on the whereabouts of Vidal or Medrano are asked to contact the sheriff’s office at (956) 687-8477.